You are here: Home / Bread / Avocado Stuffed French Toast with Poached Egg – gluten free! Avocado Stuffed French Toast with Poached Egg – gluten free! Today I bring you Avocado French Toast with Poached Egg made with the White Sourdough Artisan Cob from Newburn Bakehouse by Warburtons. If you love avocado on toast then you’re going to absolutely love this French Toast version with a hint of chilli and lime. I was late to the whole smashed avocado party but now I can’t have enough! So back to Newburn Bakehouse, who I’m sure many of you know by now to be the champion of gluten free bread. The White Sourdough Artisan Cob is just one of five artisan loaves from Newburn Bakehouse, the others are: Classic White Artisan Loaf, Seeded Sourdough Artisan Boule, Breakfast Artisan Cob with Sultanas & Orange and Artisan Tiger Loaf which is the latest addition to the stable! I enjoyed the Breakfast Artisan Cob buttered this morning and can imagine it great toasted for a tea time treat too! 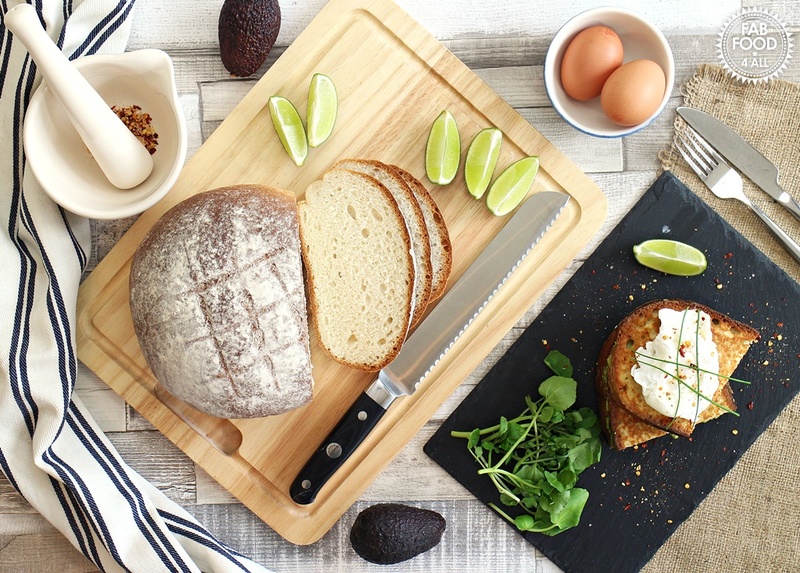 Artisan bread is enjoyed by food lovers up and down the country so Newburn Bakehouse decided that people who have to or choose to follow a gluten free diet shouldn’t have to miss out on this little luxury. If you didn’t already know, “artisan” means a high quality and distinctive product, made in small quantities, using traditional methods such as hand moulding. 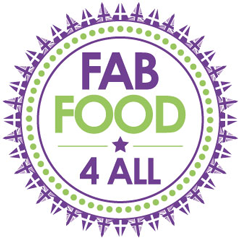 Made in the gluten free, wheat free and milk free Newburn bakery near Newcastle, by a team of highly skilled bakers, this new range of artisan breads from Newburn Bakehouse really fills a gap in the market. Best of all unlike artisan bread made with wheat the Newburn Bakehouse artisan range has a long shelf life, my loaves had eight days on them! I hadn’t realised that 1% of Brits suffer from coeiliac disease so it’s great that Newburn Bakehouse have set about bringing a range of tasty artisan breads to the market. Each loaf is hand finished and I love that they all look slightly different from each other, most likely the different bakers having a hand in that! 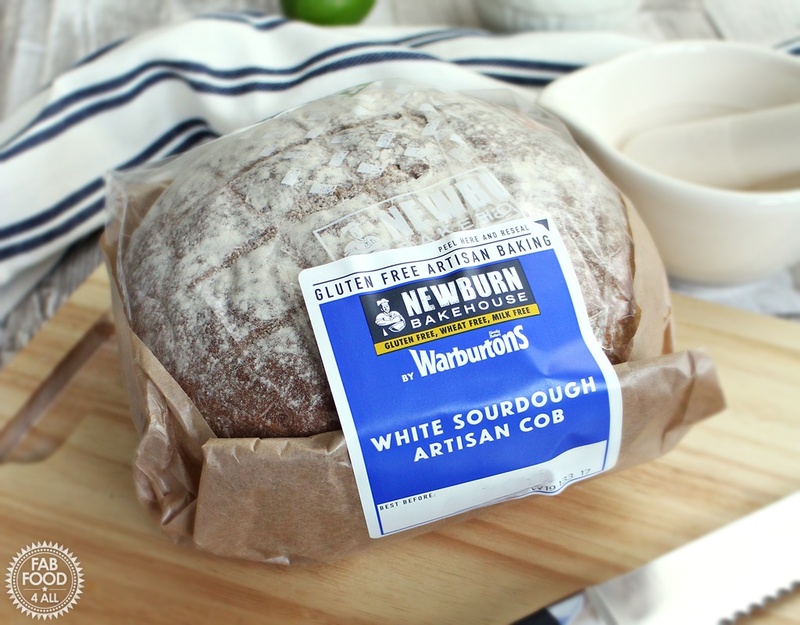 I was thrilled when Newburn Bakehouse, Warburtons asked me to come up with an exciting gluten free recipe for the White Soudough Artisan Cob. I love avocado, chillies, lime, french toast and poached eggs so I decided to combine all these in this Avocado Stuffed French Toast with Poached Egg. 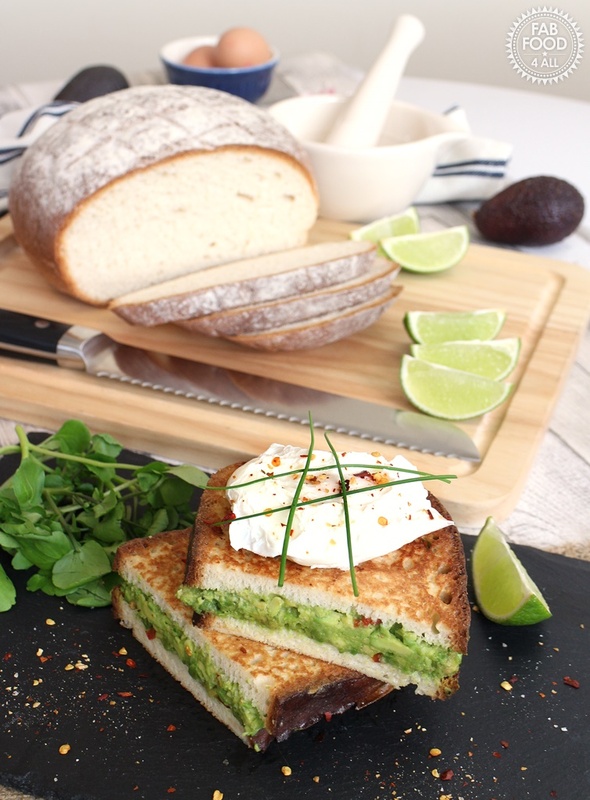 It’s so good and works perfectly with the White Sourdough Artisan Cob, even my reluctant hubby tried this while I was developing it and loved it. My avocado loving daughter is not best pleased that she’s been missing out whilst at school so I’ve promised to make this for her at the weekend. I think this is the perfect breakfast, brunch or lunch and is so quick to make that I’m sure you’ll be making this again and again, I certainly will be! Image courtesy of Newburn Bakehouse. Do let me know if you try my Avocado Stuffed French Toast with Poached Egg in the comments below. 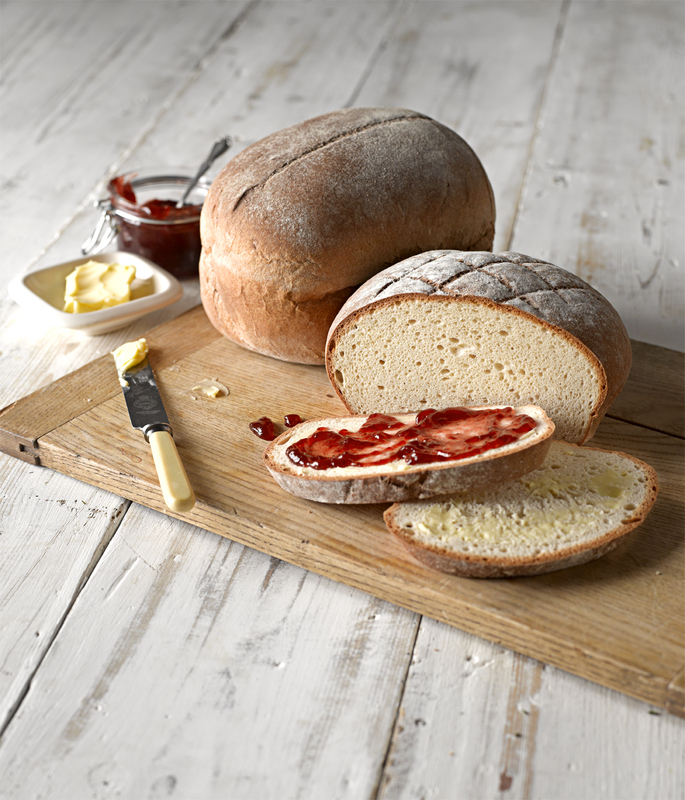 The Newburn Bakehouse artisan range (all unsliced) can be found in the free from aisle at Morrisons, Sainsbury’s, Tesco and Waitrose. You can check out your nearest stockist over at Newburn Bakehouse. Avocado Stuffed French Toast with Poached Egg - gluten free! Gluten free Avocado Stuffed French Toast with Poached Egg has added zing from lime juice and jalapeno peppers - quick and delicious, you will be hooked! Beat egg and season with salt & pepper. Pour onto a large plate. Halve and stone the avocado, then mash with a fork adding a generous squeeze of lime juice, chopped red jalapeños, salt and pepper. Spread onto one of the slices of Sourdough, then top with the other slice. Dip both sides of the sandwich into the beaten egg. Place oil and butter in a frying pan over a medium heat. Meanwhile boil a kettle of water and add enough water to a small pan (I use a frying pan) to just cover a poached egg along with a splash of vinegar. Crack an egg into a small bowl or ramekin then gently lower and tip into the boiling water and set timer for 3 minutes. Put sandwich into frying pan and fry for about 1 minute or until base is golden, then flip over and fry on the other side. Drain poached egg on paper towel. 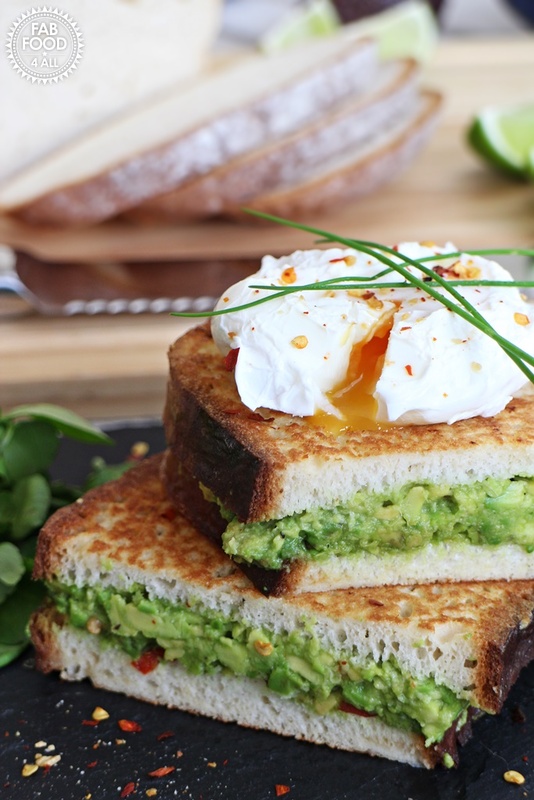 Cut Avocado Stuffed French Toast in half and stack, placing the poached egg on top. Garnish with chives plus a grind of dried chilli and garlic. Feeling lucky? 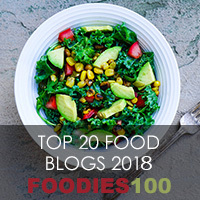 You might want to enter my Newburn Bakehouse competition to win a Gluten Free Health & Fitness Hamper worth £193 – check out my competition page! Previous Post: « Granny’s Quick Lemon Curd – tangy & delicious + video! Question please. Is the toast supposed to be crispy after frying? This looks incredible. I might have to try this! Really really like the sound of this! 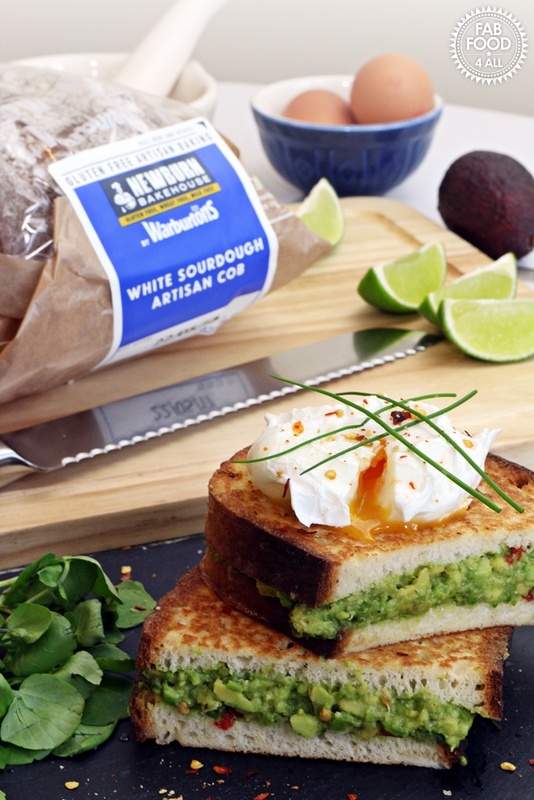 Love the combination of eggs and avocado already, and I do enjoy sourdough bread. The Warburtons looks really good actually. Surprising combination but I like it! Will have to make this soon.